A cycling rain jacket is an indispensable garment that will keep you comfortable and on your bike when the weather goes bad. 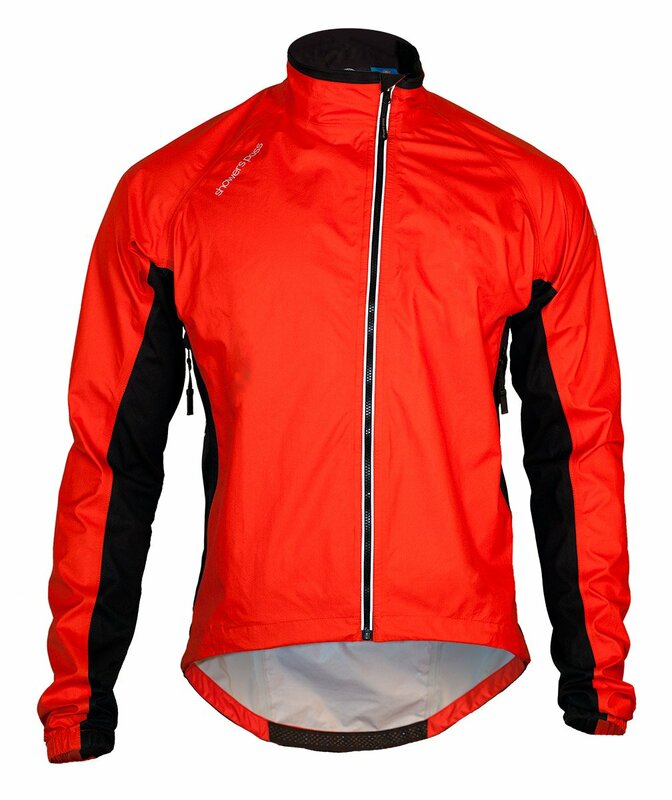 It is not only rain that a cycling rain jacket can protect you from, but wind and cold too. It is a convenient garment that you can slip into a jersey pocket and keep there in case of emergency. If you are heading out in variable weather you should carry a cycling rain jacket in your pocket. Variable weather covers not only rain moving in where you are now, but also elevation changes along with riding at dusk when the temperature drops quickly. Riding in the mountains where temperature can fluctuate greatly and weather can move quickly requires a cycling rain jacket almost every day. Climb to the summit and you will be overheating but on the way down you are likely to get chilled to the bone because you are covered in sweat and not working very hard while coasting. Heading out for a ride that will go past dusk is also a great time to have a cycling rain jacket. Once the sun moves below the horizon, expect temperature to drop, especially if you live somewhere that does not retain heat, like the desert or coast. You will be glad you packed it for the ride home. A cycling rain jacket will also prove useful if you have to stop to change a flat or for some other unforeseen circumstance. Standing on the side of road and shivering is no way to quickly change a flat. Put on your jacket and you can stay comfortable until it’s changed or your ride arrives. Needless to say, the most important feature of a cycling rain jacket is that it is waterproof. If it is not waterproof, it is a mislabeled wind jacket. Read reviews and talk with people that are familiar with a specific cycling rain jacket to determine how waterproof it is. When riding in the rain and other low light conditions, it is nice to have extra visibility for drivers. 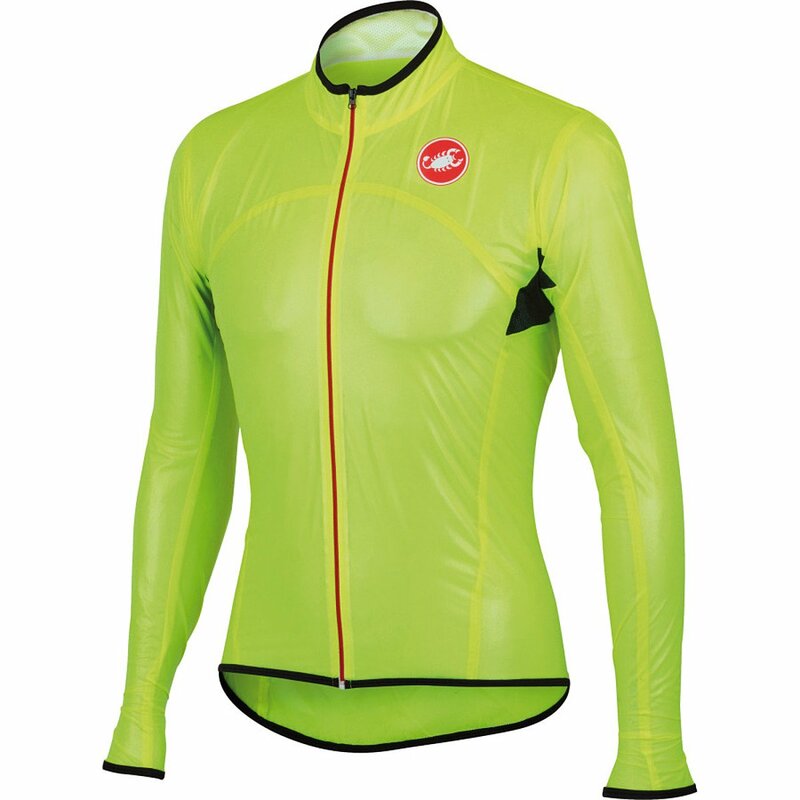 A cycling rain jacket should have reflective patches to make you more visible to traffic. This does not replace having good lights but additional help is always a plus as if it’s raining, visibility is also reduced for drivers. The rear of a cycling rain jacket should extend down past where a normal jacket would to cover your backside from road spray. You will still get wet because your bibs are not waterproof; the tail is there to protect you from direct spray from your rear wheel. A quality zipper goes a long way to making your cycling rain jacket easy to use. When the rain comes pouring down or you are wearing full finger gloves, a good zipper will make it easier to get your jacket on quickly and easily. Storing your cycling rain jacket in a jersey pocket is a must. The jacket has to compress down and be light enough that it is not cumbersome otherwise you won’t want to take it with you on a regular basis. Bonus points to the jacket if it is small enough to go in your pocket and still fit other essentials in the same pocket. Cycling is an energy intensive activity; ideally your cycling rain jacket will allow your sweat to evaporate so you can stay dry inside. It is a tough balance to strike. Your expectations are too high if you expect to be perfectly dry and cool inside your jacket while keeping the precipitation at bay. Claims of cycling rain jackets (or any rain jacket) being waterproof and breathable are usually overblown. The bottom line is expect to get clammy inside your cycling rain jacket, but remember that it will not be nearly as bad as if you were riding without a jacket at all. Here are a range of 5 cycling rain jackets that may work for your needs and budget. Showers Pass is a relatively recent arrival on the cycling scene but they have made a great impression with their rain gear. Their Spring Classic Jacket sets a high bar that other cycling rain jackets should aspire to. It has all of the necessary features mentioned above packed into a well tailored cut. As you would expect from a nearly perfect jacket, this is the top end of the price range. The Castelli Sottile Due Jacket is a very lightweight package that will prove itself useful while allowing you to forget it’s even there with its small size. At just under six ounces, it is easy to tuck in your pocket in case of bad conditions. An bonus feature of the jacket is a zipper at the back so you can access your jersey pockets. 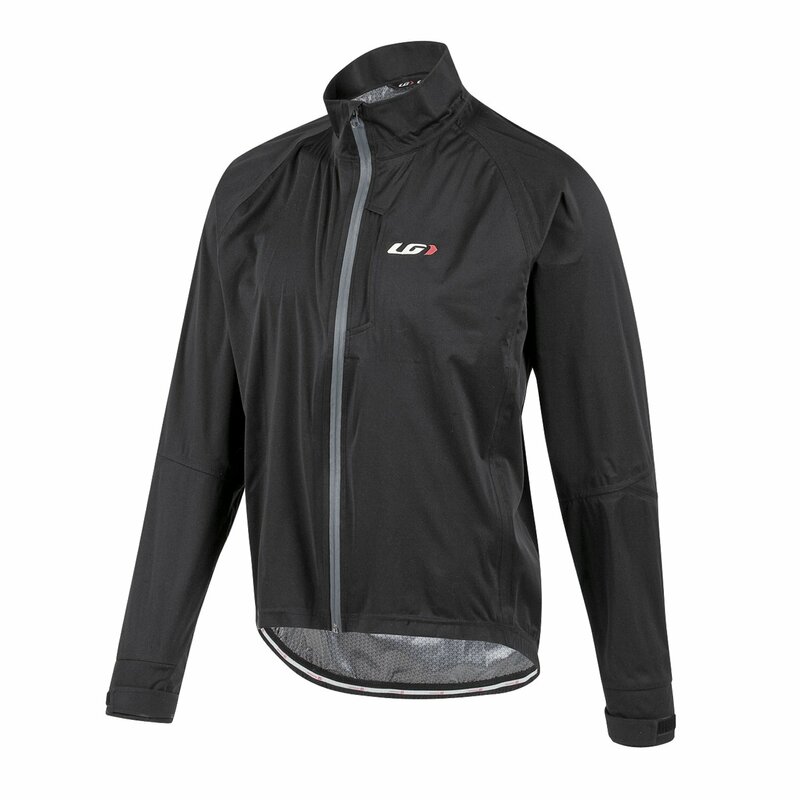 Louis Garneau’s Commit Waterproof Cycling Jacket has more features than the average cycling rain jacket. It has additional pockets and adjustment points to tailor the jacket to your needs. It will not pack down as tightly as the previous two jackets, but if you are going to spend a lot of time in the rain, this is a good choice. Pearl Izumi’s Pro Barrier Lite Jacket is what you expect when you think of a cycling rain jacket – translucent, lightweight and not quite waterproof. It will keep you warm and dry under light precipitation, but once it starts pouring, you are going to get wet. It has a race inspired cut to keep the jacket from flapping while you are ripping down the mountain. 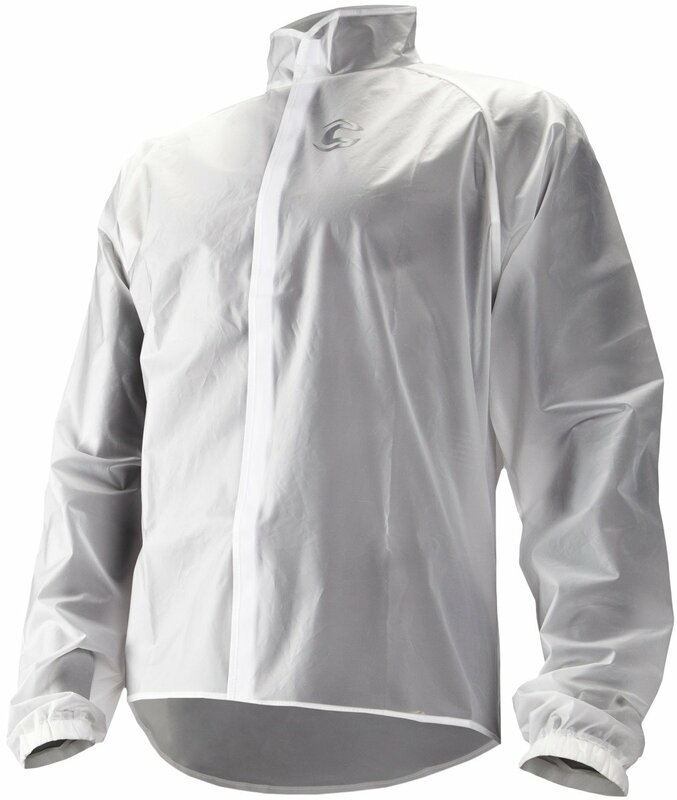 Cannondale’s Clear Rain Shell is about as basic as a cycling rain jacket gets. Until recently, jackets like this were all that existed. It makes no claims of breathability but it will shed the rain. A nice feature to keep the bulk down along with making it easier to put on is instead of using a zipper it has a velcro strip. Now that you know a bit more about cycling rain jackets, you can head out in less than ideal conditions and still have a comfortable ride.